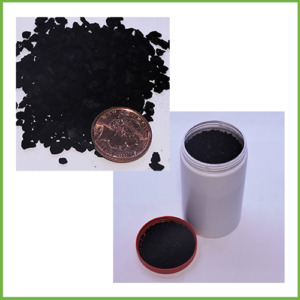 NP All-in-One BioPellets are used to efficiently remove both Nitrates (5x) and Phosphates (10x-20x) without the need to use separate phosphate removing media or 2 separate reactors. 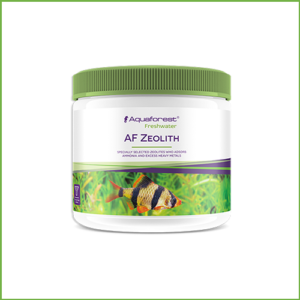 The new formula All-in-One BioPellets are composed of highly purified compounds, to ensure the safe use in marine aquariums with sensitive animals such as corals. 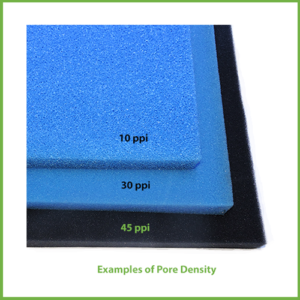 The positive effects of NP All-in-One BioPellets on water quality are based on the principle of immobilization. The pellets will allow aerobic bacteria to grow and consume nitrate and phosphate. The bacteria will use up the carbon from the All-in-One BioPellets whilst nitrogen and phosphorus are taken from the water as nitrate and phosphate. This conversion of organic BioPellets (together with inorganic nitrogen and phosphorus) into microbial biomass is called immobilization. 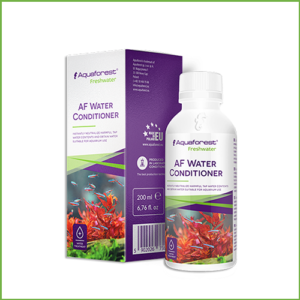 We recommend soaking All-in-One Biopellets for a period of 24 hours in marine aquarium water before use in your aquarium reactor. This will insure more uniform tumbling once added to the reactor. All-in-One BioPellets are heavier than NP BioPellets and requires a higher flow rate to tumble the media. For example a 700 litre aquarium with a reactor containing 2 litres of All-in-One Biopellets will require a minimal flow rate of 2000-3000 l/h. Results after 10 months: The bio load on a 700 litre aquarium with 2 litres of media contains approximately 50 fish and after 10 months of testing both nitrates and phosphates were undetectable with standard nitrate and phosphate aquarium test kits. The surplus bacteria will be consumed by filter feeding organisms, such as sponges and corals, or skimmed off by a protein skimmer. 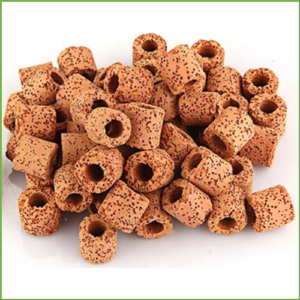 If you have a high feeding regime we recommend using a simple filter sponge on the outlet of your reactor to remove excess of bacteria which will otherwise cloud your water slightly. On average the NP All-In-One Biopellets takes 1-4 weeks to give rise to sufficient bacteria to allow nitrate and phosphate levels to drop. It is Important to allow your aquarium inhabitants to adjust to their new environment by slowly increasing the level of BioPellets over a period of several weeks. 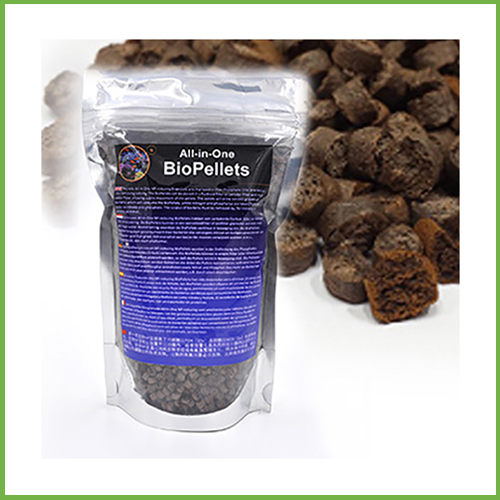 Add extra pellets every 3-6 months dependent on Biopellet consumption and levels of nitrate (NO3) and phosphate (PO4). 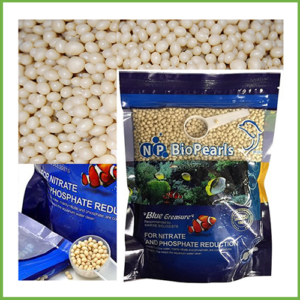 The use of NP All-in-One BioPellets in marine aquariums must be accompanied by the use of a protein skimmer to export bacteria and assimilated nutrients. The use of ozone and UV will negatively affect bacteria growth and consumption of the BioPellets and increase the maturation time of the reactor. We do not recommend using All-In-One Biopellets with ozone or UV. 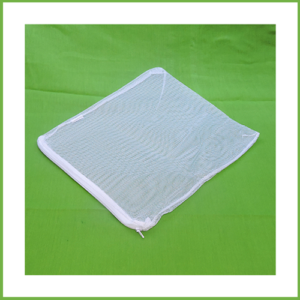 We recommend that you maintain sufficient water flow through the BioPellets to prevent the production of hydrogen sulphide gas which will kill the beneficial bacteria.